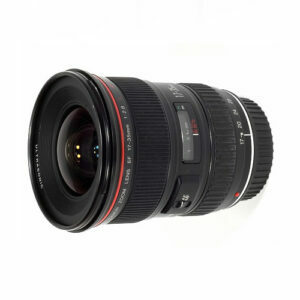 Lens Description: A large aperture, super wide angle zoom lens with the wide-angle focal length of 17mm. The optical system has two aspherical elements, including the first lens element which is a ground and polished aspherical glass lens element, thoroughly eliminating the distortion that is normally a problem with wide angle zoom lens. This lens delivers sharp and crisp performance throughout the entire zoom range. Its ring USM (Ultrasonic Motor) drive and inner focusing contribute to silent and fast AF, full-time manual focusing and superb picture quality in close-range photography. Since the front lens element does not rotate during focusing, use of circular polarizing filter is facilitated. The drop-in gelatin filter holder at the rear can hold three filters. A large, dedicated, petal-shaped lens hood offers superior light shading.